Ban Johnson Field, also known as Whittington Park, was a baseball park in Hot Springs, AR and was the home field of the Hot Springs Vapors in 1906, Hot Springs Vaporites from 1908-1909 and Hot Springs Bathers from 1938-1941. The ballpark was also a major and minor league spring training camp from 1894 to about 1939. The ballpark was built in Hot Springs, AR during the city’s prime. Hot Springs attracted major league teams who began using the city for spring training in 1886. The drawback for these teams though was adequate grounds to practice on. So Ban Johnson Field was built to accommodate the teams for spring training. The ballpark was located on Whittington Avenue in an area known as Whittington Park, named after Hiram Abiff Whittington, an early settler and pioneer of Hot Springs. When the baseball park opened, it assumed the same name. The area around the ballfield also featured an artificial lake, walking paths, and bridges crossing over Hot Springs Creek. Work began on the Whittington Park ballpark in February. Located next to a mountainside, it quickly became apparent the site was not an ideal place for a baseball field. The area was very rocking and not level. To make matters worse, Hot Springs Creek ran though the middle of the property. Nevertheless, the field was leveled and cleared, while the creek was redirected. By mid March, Whittington Park was completed and ready for play. The original field was oriented northeast, and a small grandstand was located behind homeplate. That spring, the Chicago White Stockings became the first team to train at Whittington Park. Later that year, Hot Springs entered a team in the 1894 Arkansas State League, playing at Whittington Park. The team ceased play in mid-season. In the remaining years of the 1890s, Whittington Park was used by Chicago and several other major league teams for annual spring training. In addition to Chicago, the Cleveland Spiders and Pittsburgh Pirates also trained at the park during the decade. By the turn of the century, spring training at Whittington Park slowed down and stabilized. After the St. Louis Cardinals trained there in 1900, Pittsburgh made the park their permanent spring training home and spent every spring there until 1917. During that time, Pittsburgh also shared the park with the Detroit Tigers in 1908 and the Brooklyn Dodgers in 1911-1912. In addition to spring training, Whittington Park also became the home field of several professional teams during the era. Hot Springs had a team in the 1897 Arkansas State League, 1898 Southwestern League, and 1906 Arkansas-Texas League. In February of 1907, Hot Springs received four straight days of strong rain, flooding the city. Hot Springs creek, which ran just next to Whittington Park, overflowed its boundaries and carried away the grandstand at the park. The park was unable to seat any spectators that spring and players were forced to keep off the field for a while. The next spring, the grandstand was rebuilt, and just in time too. Hot Springs reentered the Arkansas State League and won the pennant. The team returned in 1909, finishing 3rd. The league disbanded the following year and Whittington Park did not host another professional team for nearly 30 years. By 1910, the flooding problem at Whittington Park forced action. The grandstand needed to be moved away from the creek, so the mountainside in left field was razed and a new grandstand was erected there. The field was now oriented southeast with the creek running behind left field. The problem was, the field had to be shrunk so much so that left field became only 260 feet away. But despite efforts, Whittington Park continued to have flooding problems. That same spring, a spigot on a spring house located near the third base line was left on, flooding the field. In March of the following year, a spring, for which Hot Springs was famous, pop up in left field, again flooding the field. To combat the problem, a crew of men worked night and day to install a new $1,200 underground drainage system before spring training started. The system was likely the first of its kind in the state. Following the 1916 season, the Pittsburgh Pirates decided to hold their upcoming spring training elsewhere rather than in Hot Springs. So in 1917, the Brooklyn Dodgers again took over Whittington Park, where they spent their spring. The team returned for a second year in 1918, but they too went elsewhere the following spring. For the first time ever in 1919, Whittington Park was not the site of a major league spring training camp. Not a single major league team trained in Hot Springs that year, but it didn’t take long for them to return. The following year, the Boston Red Sox trained at Whittington Park, and continued to do so through 1923. In the years to come, Whittington Park continued to be used by major leagues teams as practice grounds for pitchers and catchers during spring training, but was never used by a major league team as a permanent spring training site ever again. In 1926, the Pittsburgh Pirates returned to Hot Springs because of the poor weather conditions at their spring training camp. They trained at Whittington Park for the remainder of the spring, but did not return. From then on, numerous minor league teams utilized Whittington Park until the beginning of World War II. 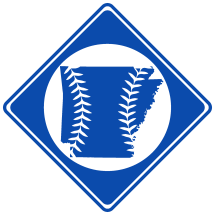 The Milwaukee Brewers, Minneapolis Milers, Indianaplois Indians, Saint Paul Saints, Montreal Royals and Baltimore Orioles, all class AA teams, were regular visitors to Hot Springs during the spring. During all this time, Whittington Park remained pretty much unchanged since it was rebuilt in 1910 –that is, until March 28th, 1930. On that day, a fire broke out at Whittington Park, and before the fire could be controlled, it consumed the wooden grandstand, burning it to the ground. The cause of the fire was never discovered, but it was suspected to have been of incendiary origin. After $3,000 worth of damage to the park, the grandstand was rebuilt in the same location. In 1933, Ray L. Doan opened his “All-Star Baseball School” at Whittington Park. The school was instructed by numerous major league players and drew aspiring young baseball players from across the nation. The school run through 1938, and afterwards, Hall of Fame second baseman Rogers Hornsby started his own “baseball college”, which annually operated at Whitington Park until the park closed. During the 1935 spring baseball school, Doan decided to rename Whittington Park. The field was dedicated as “Ban Johnson Field” on February 15th in honor of the founder of the American League, Byron Bancroft “Ban” Johnson, a regular visitor to Hot Springs. The next season, $500 worth of lighting equipment was installed at the park, and for the first time, night games were played there. A couple years later, professional baseball returned to Hot Springs, and of course, the team was to play at Ban Johnson Field. But after the team, known as the ‘Bathers’, completed their first season, it quickly became apparent the field needed some improvements. So, in 1939, the park was renovated. One of the first improvements at the park was installing a 15-foot high right field fence. The fence was only 260 feet away from home plate, causing an abundance of homeruns to be hit during the Bather’s first season. According to the club secretary Warren Banks, the overdose of homeruns cost the team exactly $894.04 worth of new baseballs. Later that year, during a Bather’s game against the Monroe White Sox, a fan sitting on the high right field fence fell backward, broke his neck and died. Also among the renovations included adding new box seats in front of the grandstand, building a new press box and installing a public address system. The bleachers down the 3rd baseline, known as the “Wolves’ Den”, were extended 50 more feet and the left field’s incline was leveled out. The total capacity of the field was around 2,000 after the renovations. The Hot Springs Bathers continued to play at Ban Johnson Field through 1941. That season, the Bathers won the class C Cotton States League championship. The following year, the league ceased operation due to World War II, and a professional baseball team never called Ban Johnson Field home again. With WWII, the Bathers gone and spring training pretty much non-existent in the city, Whittington Park was largely left vacant. Sometime during the war, the grandstand was torn down, and in 1947, a race track known as the ‘Whittington Park Speedway’ was built on the ballfield. Today, the only sign that Ban Johnson Field was ever located on the site is small section of remaining bleachers in the mountainside. The property is now owned by the Weyerhaeuser Company, and the field is now underneath a parking lot. Over the years, dozens of Hall of Famers played at the park, including the likes of Cy Young, Babe Ruth, Honus Wagner, Walter Johnson, Grover Cleveland Alexander and Rogers Hornsby. In 1947, a new ballpark known as Jaycee Park was built on the south side of Hot Springs, taking the place of Ban Johnson Field.